When you wake up feeling great and everyone tells you how tired you look…. When you go to see the dermatologist to have a mole checked and he asks where you want the Botox…. In Older but Better, but Older, the authors of the international bestseller How to be a Parisian address, with mischievous humor and a keen eye for detail, the trials and tribulations of hurtling towards forty and then some. 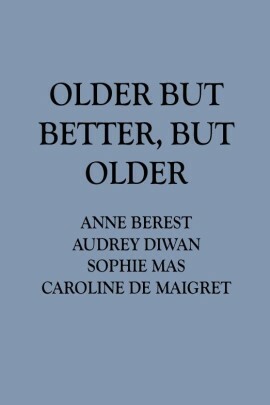 Neuroses vs. confidence, resistance vs. acceptance, passion vs. serenity: through these spirited short stories they capture all the different stages of aging – as a nostalgic but modern Parisian woman. From the privately absurd to the strangely universal, covering subjects as diverse as style, attitude, relationships and hangups, this book captures moments of everyday life that will make the reader nod, cringe and laugh out loud.